People with a non-celiac gluten sensitivity could find relief from Immunecare Glutenase Plus – a new, natural, enzyme-based supplement that breaks down gluten into more easily digested gliadin, glutenin and amino acids. People with a non celiac gluten sensitivity could find relief from Immunecare Glutenase Plus – a new, natural, enzyme-based supplement that breaks down gluten into more easily digested gliadin, glutenin and amino acids. Just to be abundantly clear, in more severe cases where the sensitivity becomes an allergy to gluten, this is Celiac Disease. This is a more serious condition where the immune system mistakenly attacks the lining of the bowel as if it was a ‘foreign’ organism. People diagnosed with this more serious Celiac Disease should avoid gluten completely as Immunecare Glutenase Plus will not address this more serious condition. The simplest ideas are often the best. Gluten requires DPPIV enzymes to break it down. A large section of the population does not not produce this enzyme in their gut, and so they have a problem breaking down wheat, rye and barley products. It has been estimated that as many as one in twenty in the western world suffer from a non celiac gluten sensitivity whereby when the gluten comes into contact with the lining of the small bowel, a reaction occurs. In mild cases, this causes discomfort and can lead to bowel problems such as IBS, diarrhoea and bloating. Immunecare Glutenase Plus can ease this level of gluten sensitivity. Food Allergies: A true food allergy or hypersensitivity is an abnormal Immune System response typically involving antibodies known as immunoglobulin E (IgE). The responses these antibodies usually cause to the consumption of specific foods include hives, itching, wheezing and airway spasms, vomiting, and tissue swelling (angioedema) in the skin, mouth, airway and/or gut lining. Also, in infants and toddlers, atopic dermatitis (eczema) is a possible reaction to a food allergen. In rare occasions anaphylactic shock can occur. These responses usually appear within a few minutes to hours after ingesting the offending food. Contrary to what many people think, true food allergies are rare, occurring in about 3% of infants and toddlers and in less than 1% of adults. In the US, the most common food allergens in children are milk, egg, peanut, soybean, wheat, and fish. On the other hand, in adults, the most common offenders are shellfish (including shrimp, escargot, squid, crab, clams, lobster and crayfish), peanuts, tree nuts (walnuts, pine nuts, almonds, pecans etc. ), fish, and egg. 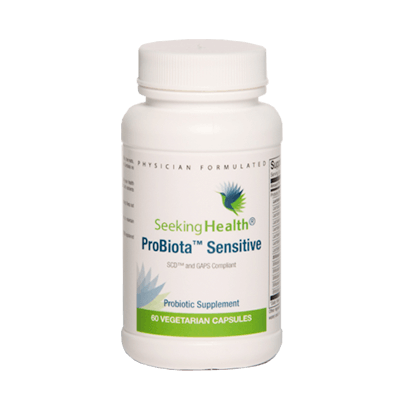 In general, the proteins or protein fragments responsible for food allergies are not broken down by cooking or by digestive enzymes. They are absorbed through the intestinal wall equally well by allergic and nonallergic individuals. The difference lies in the ability of a person’s Immune System to effectively ignore the presence of the protein. If an individual’s Immune System identifies the protein as a foreign invader, an allergic response can occur. Food Intolerances: An intolerance occurs when a direct physiologic response to a certain food is not caused by IgE. Most intolerances do not even involve the Immune System, though gluten intolerance is a notable exception. The most well-known food intolerance is lactose intolerance, which is caused by the body’s inability to break down the milk sugar lactose. Lactose intolerance is caused by a lack of the intestinal enzyme, lactase; and it results in the lactose being used as food by the bacteria in the gut, leading to gas, bloating, abdominal pain, and sometimes diarrhea. Some food intolerances are fairly obvious, such as the heartburn and runny nose experienced after the consumption of spicy foods, or the stomach discomfort and cramping felt after eating excess fatty foods. Certain foods (including those that contain histamine-like substances) can even trigger a histamine-type response, such as itching and hives. The symptoms are often very similar to those caused by allergens. Migraine sufferers are particularly susceptible to this type of reaction, which is often associated with the consumption of cheese, wines and some fish (i.e. fresh tuna). Technically, gluten is simply a storage protein found in grains and grasses. Historically, the term only applied to wheat. It is elastic and rubbery, and therefore, is used to bind dough in foods such as bread and other baked goods. Gluten is not the only protein found in grains, and virtually any of the proteins can cause adverse reactions, including allergies. For example, wheat contains four major proteins – albumin, globulin, gliadin and glutenin. Albumin and globulin are the proteins most often associated with wheat allergies, whereas gliadin and glutenin contribute more to intolerances. The type of gluten generally associated with gluten intolerance is called a prolamine. There are prolamines in most all cereal grains, but they don’t all typically cause intolerances. The critical ones to remember in regard to gluten intolerance and Celiac disease are present in wheat (liadin), triticale (a hybrid of wheat and rye), rye (secalin), barley (hordein) and to a lesser degree in oats (avenins). Other names include: Non-tropical sprue, Gluten sensitive enteropathy and Zöliakie. Celiac disease is an inherited autoimmune disorder characterized by intolerance and malabsorption of gluten, and subsequent intestinal damage. At one time it was considered relatively uncommon, but according to several recent independent epidemiological studies, the prevalence may range from 1:100 to 1:300 in North America and Europe. Both genetic and environmental factors play a role in the onset. Celiac disease is a lifelong disease, and if untreated can lead to the development of other disease conditions such as osteoporosis, intestinal cancer and lymphoma. The only accepted treatment is a strict adherence to a gluten-free diet. In recent years there has been an increase in research focusing on digestive diseases, particularly Celiac Disease, because of its prevalence worldwide and lack of treatment options. That research has led to the discovery of two important factors that play an important role in the development of Celiac Disease. One of these is a 33-mer (composed of 33 amino acids) peptide that seems to be one of the most damaging culprits in triggering gluten intolerance/Celiac Disease. 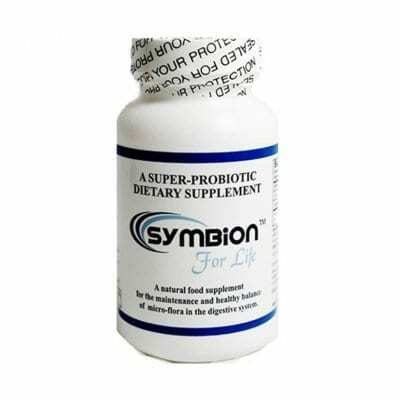 This peptide contains an abundance of residues containing the amino acid proline (and to a lesser extent, glutamine), which are resistant to the digestive action of pepsin and pancreatic proteases. For most people this peptide and others like it wander down to the small intestine and attempt to make their way through the intestinal wall. Within the intestinal wall are several enzymes (called Brush border enzymes or BBM) two of which can break down the digestion-resistant peptides. These enzymes are dipeptidyl peptidase IV (DPP IV) and dipeptidyl carboxypeptidase I (DCP 1). These enzymes work slowly, which isn’t a problem for those without gluten intolerance; but can be devastating for individuals with this painful condition. This is because the intestines of most people with Celiac Disease are home to one or two unique Immune System molecules (called DQ2 and DQ8). These molecules and the offending peptides form complexes that activate the Immune System. 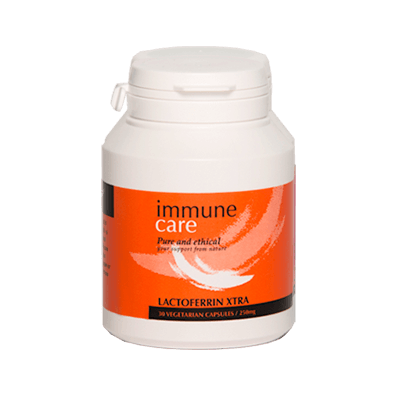 The subsequent Immune System attack damages the intestines and prevents the absorption of important nutrients. Supplemental DPP IV It seems reasonable that if supplemental DPP IV and DCP 1 were ingested in conjunction with a glutencontaining food, the protein could be efficiently broken down prior to the entrance into the small intestine. This in fact may be true to a certain extent. PEP or proline-specific endopeptidase is an enzyme that is capable of breaking some of the more resistant bonds, thereby making the shorter peptides more accessible to the action of DPP IV. This enzyme is found in the intestine, but not in the BBM and not in sufficient supply to prevent a reaction. One current theory is that a combination of PEP and DPP IV could effectively control the immune response to gluten. Unfortunately, the supplemental PEP (microbially derived) used in these studies is not gastric stable and therefore is not currently suitable for oral administration. Recombinant forms are being researched. EP B2 The most recent enzyme to gain attention is a recombinant enzyme (technically a glutamine-specific cysteine protease) produced from barley. The advantage of this enzyme is its gastric stability and ability to begin initial breakdown in the stomach of some of the longer peptides of gluten. The main researchers investigating the advantages of EP B2 advocate a combination treatment of PEP and EP B2. Considering the Dietary Supplement’s resistance to GMOs, it is hard to imagine that there would be too much interest in either PEP or EP B2. However, the desire to have a product to address gluten intolerance may override the resistance to genetic modification. Another drawback to either the PEP or the EP B2 involves IP issues. These concepts will be highly patent protected, and will most likely not be available to the Dietary Supplement market. 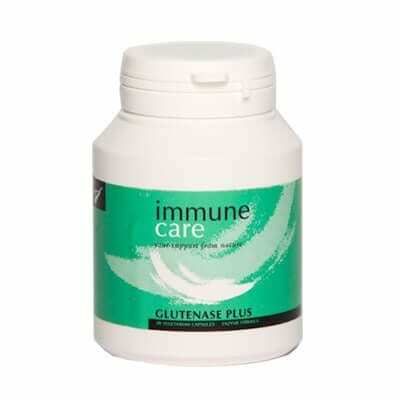 Immunecare Glutenase Plus contains enzymes that have DPP IV activity to assist in the breakdown of gluten. 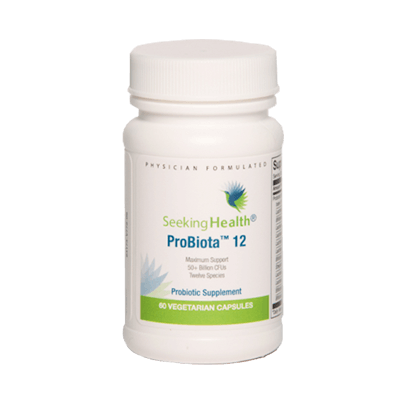 In addition, this blend contains Protease 6.0, which has been researched for its ability to control inflammation. This is a definite advantage for individuals suffering from Celiac Disease since gut inflammation is one of the main characteristics of this disease. Who Should Take Immunecare Glutenase Plus? If you find yourself becoming bloated and having abdominal discomfort soon after eating wheat products, for example bread and pasta, then you could benefit from taking Immunecare Glutenase Plus. By breaking the gluten into smaller, more easily digested parts; it encourages the body to take up gluten before it irritates the small bowel. practically every meal and I did not have one single health issue!!!!! Angie Morris has been gluten intolerant for 20 years. Following bowel and stomach surgery she has suffered badly whenever she ate food with gluten – “everything I ate went through me” she says. When Angie consulted her doctor he suggested she may be celiac and recommended she cut out foods with gluten. “Within four days of eliminating gluten I felt human again,” she recalls. Finding a solution was a relief but Angie was now saddled with a food intolerance that she had to work around for every meal, every day. While she managed at home on a limited diet, when it came to her working lifestyle it was altogether harder. Angie travelled a lot in her job as a marketing director of a display company. She spent many days each year in hotels and conferences and found it well nigh impossible to eat a balanced and varied diet. “One memorable week I was away I ended up eating steak and chips for four nights running as it was the only thing on the menu I could digest. Angie learned to cope by packing her own food wherever she went. She bought a fridge that worked in the car so she could pack up chicken and salads before going out anywhere. FIRST CROISSANT IN 20 YEARS! Then earlier this year, Angie read about an enzyme based supplement that breaks down gluten into smaller, more easily digested parts so that the body takes up the gluten before it reaches and irritates the small bowel. “It sounded too good to be true: too easy a solution after two decades of having no solution,” says Angie. “But I had nothing to lose. “I took my first Immunecare Glutenase Plus capsule and then ate a croissant. My first croissant in 20 years! Nothing happened. 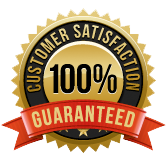 Absolutely nothing – no blisters on my tongue, no discomfort. I didn’t have to run to the loo. I was fine. I was practically crying with the relief of it all. Not just the fact I’d eaten a croissant but the realisation that I could eat gluten again without any side effects now I’d found Immunecare Glutenase Plus. How Does Immunecare Glutenase Plus Work? DPP-IV can be found in the intestinal tract lining. One of its primary functions is breaking down gluten. The DPP-IV enzyme activity assists digestion of proline-containing peptides found primarily in wheat, which are generally resistant to being completely broken down by other enzymes in people who are gluten sensitive. By introducing the DPP-IV containing enzyme to the digestive tract, Immunecare Glutenase Plus encourages break down and digestion of gluten thus rendering it non-irritant. How Do I Take Immunecare Glutenase Plus? Take one to two capsules with each meal containing gluten. New 90 vegetarian capsules size. Please note that enzyme formulations are not recommended for those with Gastritis or inflammatory conditions of the digestive tract such as Crohn’s, Ulcerative Colitits or Diverticulitis. Not recommended for diabetics. DPPIV inhibitors are becoming more common medications. To date, we have not had any complaints about interactions or interferences with DPPIV inhibitors. That may be because the human DDPIV enzymes are sufficiently different from the fungal ones, so that the inhibitors do not interact with the fungal enzymes. To be safe, we recommend that anyone taking fungal DPPIV enzymes consult with their doctor before taking any supplement product, and if they do take it, that they do not take it at the same time as the DPPIV inhibitor. DPPIV inhibitors have been approved and widely consumed for several years for diabetes, so if a supplement/drug interaction was likely, we would have seen it by now. Aside from the potential interaction with DPPIV inhibitors which is currently unknown, proteolytic enzymes such as those in DPPIV are known to possess blood thinning properties when used systemically. DPPIV is not recommended for systemic use but should be taken with food for its gluten digesting benefits. DPPIV does not take the place of a gluten-free diet for individuals with severe gluten intolerance, but rather is designed to help digest incidental levels of gluten that may be present in some foods. I have been using IMMUNECARE LACTASE PLUS and IMMUNECARE GLUTENASE PLUS for a few months now and they allow me to eat both lactase and gluten without any issues, I just wish I had discovered them 10 years ago! Many thanks for your liberating products!